Taking readers with a basic knowledge of probability and real analysis to the frontiers of a very active research discipline, this textbook provides all the necessary background from functional analysis and the theory of PDEs. It covers the main types of equations (elliptic, hyperbolic and parabolic) and discusses different types of random forcing. The objective is to give the reader the necessary tools to understand the proofs of existing theorems about SPDEs (from other sources) and perhaps even to formulate and prove a few new ones. Most of the material could be covered in about 40 hours of lectures, as long as not too much time is spent on the general discussion of stochastic analysis in infinite dimensions. As the subject of SPDEs is currently making the transition from the research level to that of a graduate or even undergraduate course, the book attempts to present enough exercise material to fill potential exams and homework assignments. Exercises appear throughout and are usually directly connected to the material discussed at a particular place in the text. The questions usually ask to verify something, so that the reader already knows the answer and, if pressed for time, can move on. Accordingly, no solutions are provided, but there are often hints on how to proceed. 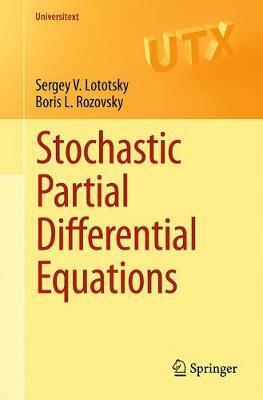 The book will be of interest to everybody working in the area of stochastic analysis, from beginning graduate students to experts in the field.